About ten years ago, Duke Coach K for Krzyzewsky was cast in a commercial where, with his nasally Chicago voice he said, “I’m not a basketball coach. I’m a leader.” And, indeed the term leader is bounced around almost as much as the leather ball itself. I offer you a case today. I wish I were in class to hear your interpretations and theories. As, in class, I will “reveal” in two stages. And offer a few takeaways. Part 1: A picture, and these questions: What do you think is happening? And what does it tell us about leadership? This photograph was taken last week. Michigan State University mens basketball coach (or “coaching legend” as he’s often referred to) Tom Izzo is “talking to” Aaron Henry, a freshman during a timeout. 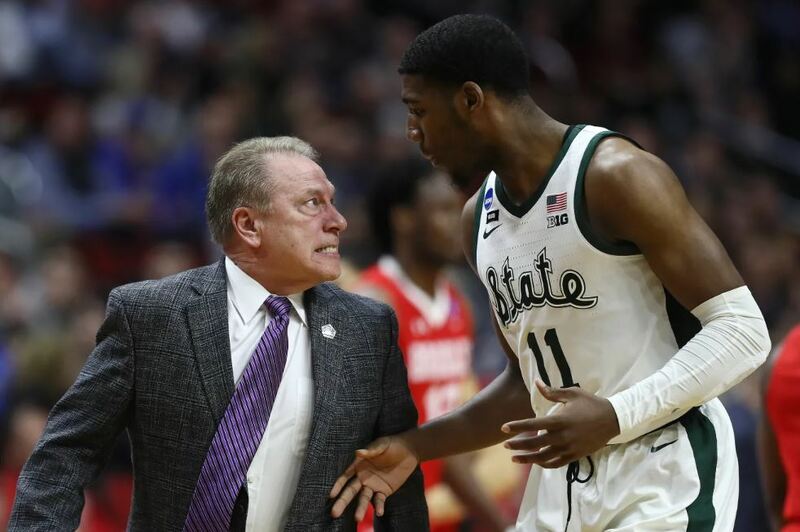 Face-reading 101, a pre-kindergarten requirement, informs us that Izzo is furious. Heck, your dog and cat could read this most basic human expression. Or does “fury” belong under madness? Should it be tagged: #OutofControl, #HimToo, #Abuse, or #AnotherInvestigationIntoMSUsports? Let me put some parameters around this inquiry. First, it is an instant only. Perhaps our judgment would change if we knew that Izzo has also shown great love for this 18 year old freshman Aaron Henry; or if Henry’s parents or Henry himself said he wants or needs to get “lit up” sometimes, and that Izzo knows his people and who gets motivated by what. Second, we’d perhaps feel much different if we knew that Izzo later did what the Army calls an “after action review” to discuss Henry’s and his own behavior; and if he reviewed his own behavior with his assistant coaches, a therapist, a priest, his athletic director, or his team captain? Was he developing emotional intelligence to examine his own role? We know none of this. You can probably tell that my view is that this is madness and NOT great leadership. Yes, Jobs and Musk and Izzo and Bobby Knight were or are geniuses at driving to create “their visionary product.” But they were terrible role models in this one respect. Their lack of self-regulation demonstrated a lack of emotional intelligence. They modeled for employees – or in this case, players as well as thousands of parents and coaches and bosses – that “sometimes you gotta get in somebody’s face and let them have it.” Their vision was distorted. They didn’t or don’t see that human growth, not just championship trophies, sales dominance, and yes, their own heroism are the measure of success. Bottom line: It is a lack of imagination on the part of a leader that says you either yell or you lose. That is a false and unimaginative choice. Bottom line: It is a lack of imagination on the part of a leader that says you either yell or you lose. That is a false and unimaginative choice. I assert that Cassius Winston exhibited greater leadership behaviors than Izzo. ** We can’t know Cassius’ motives any more than we can know Coach Izzo’s. Was he protecting a brother? Getting the coach to re-focus? What did he say when after seeming to modulate the coach he also turned to Henry? We don’t know. *Did you notice that Marv Albert introduces this as “a little bit of animation on the part of Coach Tom Izzo.” A little bit? And the announcer (who sounds like Steve Kerr) closes this reply: “and we’re all friends now.” This is hashtag material. Old men supporting old men. No question here. **I am mindful of the irony that Izzo has been verbally tearing into Cassius Winston for the latter’s three years at MSU. Has Winston emerged as a leader because of Izzo’s ferocious coaching, perhaps because of his empowering coaching, and/or in spite of these. Many of Izzo’s former players pledge that he helped shape them into men of character. Draymond Green who remains close after playing for him tweeted: “Just an FYI. Being in those huddles for years. Cassius and Matt grabbed Iz so he could shut up and move on… after a while you’re just ready for him to draw up the play. Just giving perspective from someone who’s been apart of those huddles…” “And the reason he wouldn’t stop is because Aaron Henry kept talking. However, what the world doesn’t know is that Iz loves the kid who will challenge him back more than anything! So there’s some insight For you all! !” Tough love? Or over the line? I like to think that Cassius Winston’s character was shaped by his Detroit Jesuit High School education, where the motto is being “men and women for and with others.” To me, he demonstrated the Jesuit values of being “loving” and “committed to justice,” when the one in power landed with full force on one of the most low-status members of a social group.